What does it take to inspire young people to enter a life of science? Ask UCLA's chapter of the Society for Advancement of Chicanos and Native Americans in Science (SACNAS), which has organized around this task. For its "outstanding outreach and collaborative efforts" this year, the group has been recognized as a 2011 role model chapter by the SACNAS national office. Dr. Sonia Zarate, academic administrator at UCLA's Undergraduate Research Center for Sciences, Engineering and Mathematics and the Center for Academic and Research Excellence (URC–CARE), who serves as an adviser to the group, said the chapter worked hard for this honor; it was one of only eight nationwide to receive a 2011 role model award. "I am so proud of these students for extending a hand out into the community to inform and excite school children who might not otherwise think they could be scientists," Zarate said. "Many of the chapter members are the first in their family to attend college and have really benefited, in terms of their academic and professional development, from involvement with SACNAS. So they know firsthand the importance of reaching out and serving as mentors to future generations of scientists." 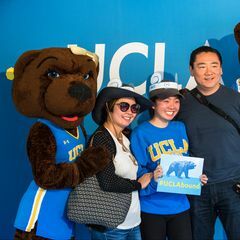 During the 2010–11 academic year, the UCLA chapter organized a variety of events both on and off campus that helped introduce more than 1,500 middle and high school students to the wonders of science. The group was led by chapter president Roky Coria, a senior biology student at UCLA. "SACNAS has expanded my horizons," said Coria, who is also a trainee in the Minority Access to Research Careers Undergraduate Student Training in Research program, a National Institutes of Health–funded honors program. "I have met so many people who come from similar backgrounds as me who are now succeeding in their field, and it inspires me to work that much harder toward my goals." Coria said the UCLA chapter also has become his support network. "We inform and encourage each other to take advantage of research opportunities and challenge ourselves to strive for excellence in every aspect of our lives — from our own career goals to the impact we have on our community," he said. In informing the UCLA chapter of its award, SACNAS program manager Tanya Beat said, "Your example has made the UCLA group an outstanding and unique chapter. We look forward to having you help others replicate your success." Among the many reasons for the honor was the chapter's "science day" at Culver City Middle School, where 1,000 students participated in hands-on science activities, including learning about ecology by assembling a terrarium and studying molecular biology by making a polymer similar to Silly Putty. Data collected after the event showed that, as a result of the experience, more of these students were interested in science, understood the relevance of science in their lives and were more familiar with careers that utilize science. Sonya Lopez, an engineering graduate student and chapter's outreach coordinator, organized the daylong event. The chapter was also recognized for its collaborations with various like-minded campus organizations on events such as Engineers in Training Day, which brought 300 middle school and high school students to campus. At the event, the UCLA SACNAS chapter taught students the basics of molecular biology and led them in the extraction of genomic DNA from strawberries. 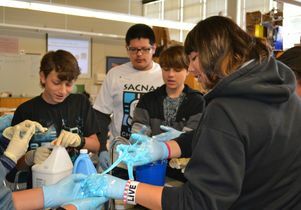 In another event, the chapter collaborated with UCLA's Early Academic Outreach Program and Alpha Chi Sigma chapter to conduct science modules for 200 Los Angeles Unified School District high schoolers, including a chemistry module in which students made ice cream using liquid nitrogen. The chapter also has a strong mentoring program on campus and holds social events to help foster a sense of community. In the coming academic year, the chapter plans to hold a number of similar activities, both on and off campus. This year, the focus is to reach out to not only high school and middle school students but to elementary students as well. "We hope to reach out to younger students and help them begin to identify as scientists and make them aware of the myriad of science career options," said Zarate, the group's adviser. 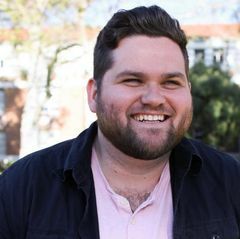 The group, which was established at UCLA a few years ago, has about 50 undergraduate and graduate members; a number of postdoctoral scholars, faculty and staff also participate. 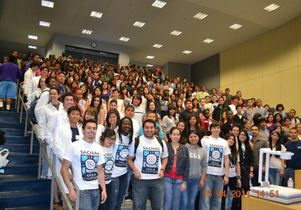 The UCLA chapter will be honored at the SACNAS national conference in San Jose, Calif., which runs from Oct. 27 to 30. SACNAS, established 38 years ago, is a nonprofit national organization dedicated to advancing Hispanics/Chicanos and Native Americans in science by promoting interest in quality science, technology, engineering and mathematics research; teaching; leadership; and policy. 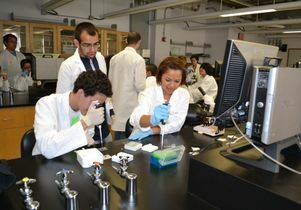 Among its goals is to increase the number of Hispanics/Chicanos and Native Americans with advanced degrees in science.